Domainers – individually and collectively – have to start thinking more strategically. Until now, we have essentially been a rag-tag group of speculators – some more successful than others – who are largely focused on the one-off, tactical sale. As long as that mindset continues, we will be collectively responsible for ensuring that: a) outsiders’ perception of us remains poor, b) partnerships with major corporations are rare, and c) these asset prices never reach fair value. Domainers need a standard value proposition. Notice that there are three distinct elements in that statement: domainer, standard and value proposition. Each element needs to be defined before we can proceed. Domainer: What is a domainer? Although numerous definitions have been put forth, most fall short because they are too shallow; for example, “Someone who buys and sells domain names.” I would define a domainer as “an individual who or entity that researches, evaluates, registers, collects, stockpiles, monetizes, develops sites (built on), markets, sells and transfers website addresses.” It is a bit long for a slogan, to be sure, but those are the activities in which domainers engage. Standard: I would challenge anyone in this “industry” to cite three standards that give comfort to prospective domain name buyers – and I am not referring to using an escrow service, or counting on the legitimacy of your registrar. Which well-known blogger has ever attempted to create a Domainer’s Code of Ethics, a standard sales-contract template (such as an ISDA Master Agreement or the AIA Contract Documents), or a value proposition for end users? If someone has, then I must have missed that post. If we ever want to be considered a real industry – not just a renegade group of speculators and cybersquatters – we need to create standard business practices and protocols. Value Proposition: A value proposition is, for all intents and purposes, a bundle of benefits associated with a product or service. For example, the Droid phone I carry: a) is sleek, b) is incredibly responsive c) has a gorgeous screen display, d) can run over 200,000 apps and e) costs less than $200. Notice that these benefits are viewed from the user’s or owner’s perspective, not from the perspective of the manufacturer, retailer, app developer or society. As such, the value proposition of a domain name matters only to the current or future owner of that website address. When a prospective buyer of a domain name (or any asset, for that matter) needs a shorthand way of evaluating their potential return on investment, their understanding of a clear value proposition can be the deciding factor in whether or not they make the commitment. This is particularly true when a corporation or start-up shows interest in a name. The days of making a compelling argument to buyers based on traffic stats, original registration date or success with search engine optimization (SEO) are waning. Most other industries seem to do a better job than we do in standardizing processes and business methods. For example, the over-the-counter derivatives industry mandates the use of standard contract templates, which identify the participant on the other side of the trade as the “counterparty.” That is the type of moniker – and mindset – that our marketplace needs. Domainers must stop viewing the legitimate prospect who inquires about a name as the greater fool to whom we are thrilled to pawn off our treasure, or garbage, as the case may be. Prospects are our clients and counterparties – period. If we want to see more of them knock on our door, we need to treat them with respect and give these counterparties an extremely compelling set of reasons to do business with us. And the way in which we communicate those compelling reasons begins with the creation of an industry-sponsored value proposition. Earlier this month on Domain JD, I offered a 10-point value proposition for domain names, which employs an easy-to-remember acronym: SEE BID MADE. My hope is that this model will spur a lively conversation, with the end result being a crowd-sourced finished product that all domainers will adopt, post on their blogs and use in conjunction with their sales efforts. If we create and promote a standard value proposition for this industry, everyone wins – including our counterparties. The SEE BID MADE acronym represents the following 10 benefits for end users. These benefits answer the question, What will the acquisition of this particular domain name do for my business, website or product? How many times have you wondered what the chief marketing officer of XYZ Company was thinking (or drinking?) when you saw its ad, which promoted a non-intuitive, long-tail domain name? Far too often, I’m sure. Worst still are the legions of start-ups which launch fanciful brands consisting of seven vowels (and forcing them to use identically absurd domain names), that no one can spell or even pronounce. These illogical choices are often a function of: a) the founders’ belief that their ridiculous name will differentiate their baby from others in the neighborhood, and b) advice from their trademark lawyer to pursue this path versus using a more intuitive name, because it will (allegedly) strengthen their IP rights. The most fundamental mistake that an online business can make is to select the wrong brand name – and, by extension, the wrong domain name. If a prospective customer cannot immediately find your website, or your domain name fails to convey a rock-solid, professional message, you already have two strikes against you. Today, people are not shy about posting their negative experiences on Twitter, and all of those posts are collectively – and instantaneously – analyzed by your competitors using sentiment analysis tools to exploit gaps and opportunities. The best – and least expensive – way to strengthen the perceptions that your customer and prospects have about your brand is to select an optimal domain name. The ways in which you portray your online venture will quickly convince customers that either you are a legitimate business that can be trusted to fulfill their order, or you are a sole proprietor working out of a 70s-era RV parked in the Mojave Desert. Investors buy shares in companies with a solid franchise, a business that – due to its goodwill, competitive advantages and laser focus on user experience – generates an excellent annuity. Before the Web came along, franchises like IBM and Xerox set the business franchise standard. Now, Facebook and Twitter are much better examples. Think of Facebook as today’s version of the medieval marketplace, where townsfolk came to buy, sell, gossip, complain, be entertained and meet their future spouses. The classic town square generated significant franchise value because of the unique role it played in local citizens’ lives. But Facebook, because of its global reach, may turn out to have, literally, immeasurable franchise value because it has become the world’s market square. Facebook all started with a domain name. And lest anyone think that Facebook’s reliance on website addresses has faded, just ask The American Farm Bureau, to whom Facebook paid $8.5 million for FB.com. Owners of both real property and intellectual property (IP) possess a fundamental right to exclude others from using that asset. Dedicated bloggers and website owners spend their lives (and wealth) creating, licensing and publishing valuable content. A domain name serves not only as the highway over which visitors travel to your website – it is also a moat that protects your virtual castle. Using an effective domain name helps you widen your moat by capturing type-in traffic, or improving your Google rankings in a post-Panda2 environment, thus slowing the advances of troll invaders, and affording your developer-army time to regroup and call in SEO reinforcements. Domainers instinctively understand how critical it is to cover all bases when it comes to protecting the resale value of a website address. Unlike most end users, we have learned the hard way that you had better also register the plural, common misspellings and synonyms for that generic domain name; and not doing so immediately can undermine the franchise value of the domain name itself. Even if you wind up registering an additional 20 names to protect the value of your core address, that is effectively a $160 insurance policy you have taken out. The additional benefit is the traffic that can be redirected from each of those 20 names – straight to the main site. Similarly, investments in related domain names (e.g., in additional extensions like .net, .org, or a ccTLD) can also be used as additional service roads. What better defense against competitors could an online business have than to own 70 percent or more of the relevant website addresses in its respective space? A brand is the identity and goodwill of a product, service, or website. Brand names and slogans can be generic, descriptive, suggestive, fanciful, or arbitrary – the last two categories being the strongest, in terms of rights. Leveraging domain names to create a great online brand is actually easier (and more protectable) than doing so in the physical world. Think of call-to-action names like VisitLasVegas.com or GroupMe.com. Although combined keywords are not always able to be trademarked (or even protectable, under common law), they can still be used to improve SEO and build billion-dollar businesses – for example, CraigsList.org, StumbleUpon.com and PartyPoker.com. As domainers are fond of repeating, every domain name is a unique asset. And unique assets create monopolies for their owners. In addition to its patents, copyrights, trademarks and trade secrets, a company’s domain name portfolio is a fundamental asset. Domain names actually solidify the IP portfolio of the modern enterprise. And in many cases, the domain name is the fundamental asset in that portfolio. Consider RealEstate.com or Hotels.com, and how critical their domain names are to their success. Even though generic words are not normally granted strong trademark protection in the United States, these brands are each listed on the USPTO’s Principal Register – the epitome of protection. The way in which Hotels.com and RealEstate.com achieved that status was to develop what is known as “secondary meaning” – that is, they each became identifiable brands in the minds of online consumers. Now imagine the implications of either of these names’ being hijacked and the traffic subsequently redirected. Should such a disaster occur, the company’s goodwill could be damaged or destroyed – as would the value of its IP portfolio and franchise, at least temporarily. The secondary meaning that the Hotels.com and RealEstate.com brands achieved was attributable to: a) heavy traffic flowing to their respective sites, which b) generated significant awareness and sales, that caused c) consumers to identify each brand with its associated services. Achieving these robust IP rights without the Hotels.com and RealEstate.com domain names may not have been possible. The world’s top consulting firms, such as Accenture, BCG and McKinsey, have built their businesses on two concepts: a) validation of management’s preconceived ideas and biases, and b) measurement of key performance indicators. Successful online businesses continually measure their health against metrics such as unique visitor counts, time spent on site, returning visitors, and Google and Alexa ranks. Each name in your domain portfolio – not just your primary one – can be used to improve your metrics by initiating type-in traffic, for instance. But more importantly, the secondary names (e.g., your call-to-action domains) can help convert your new visitors into paying customers by luring them to a site, then incenting them while there to take action. For example, a costume manufacturer could leverage its Half-Off-Kids-Costumes.com name in early October as bait, then display a “free overnight shipping” banner on their homepage to close the sale. Sales and profit metrics are, in the end, the ones that matter most from a cash flow standpoint. And if your cash flow is consistently strong, your franchise value may be the catalyst for an early retirement. Business is war. And any successful enterprise has enemies, aka “competitors.” While it is a mistake to focus on your competitors, it can be just as fatal to ignore them. Castles have always been built atop mountains, because their high location provides a natural defense against would-be raiders. The location of a business – whether online or offline – also matters; just ask anyone in real estate. Where you are is just as important as what you offer. Because an online business exists in the cloud, its builder needs a toolbox filled with superior domain names in order to create an impenetrable fortification against aggressors. That fortification, otherwise known as a website, is the only thing standing between an entrepreneur and defeat. And his domain names serve as monorails to shuttle customers above the reach of his enemies’ arrows. St. Jude Medical educates, then offers its neurostimulation system to chronic pain sufferers through its dedicated site, PowerOverYourPain.com. As people become more concerned with deteriorating economic conditions and the implications for their own families, survival gear seller Equipped.com employs EquippedToSurvive.org to captured huge online traffic. While best known for its smartphone game apps, Zynga draws just as much online traffic to FarmVille.com as the Guinness World Record-holding RuneScape.com gets. And Limos.com just raised $10 million because its site facilitates customer reviews, requires listed service providers to carry huge insurance policies, and allows visitors to compare ride prices. What these innovative companies share in common is this: They have each leveraged domain names to create a distinct association in consumers’ minds between an existing need and their own solution. St. Jude Medical and Equipped.org use call-to-action domains to target intended audiences with laser precision by using powerful keywords in their URLs (i.e., “power over” and “equipped”), which offer hope to the worried and fearful. Limos.com has been able to differentiate itself in the world of black car service by leveraging an intuitive, generic web address. Everyone likes a winner. Businesses wants to partner with those sites that attract a huge audience, and having the right domain name(s) can help a site draw a large number of visitors. If geo-specific directory sites like PalmSprings.com did not draw major traffic, local hotels and restaurants would not pay to be listed there. But because of its great domain name, CCIN (parent company of PalmSprings.com) is able to draw substantial traffic to the site, and subsequently partner with, and draw fees from, each advertiser-affiliate. We know by now that domain names are a distinct asset class – more similar to real estate and art than to stocks and bonds because they are unique, not fungible. Thus, selling a domain name requires genuine effort. Sales professionals understand that the best way to close a sale is to anticipate the buyer’s objections and make the pitch accordingly. In other words, they present the buyer with the product’s value proposition. Nothing is more satisfying to a seller than to have convinced a prospect to make a legitimate offer on their product based on a stated value proposition. 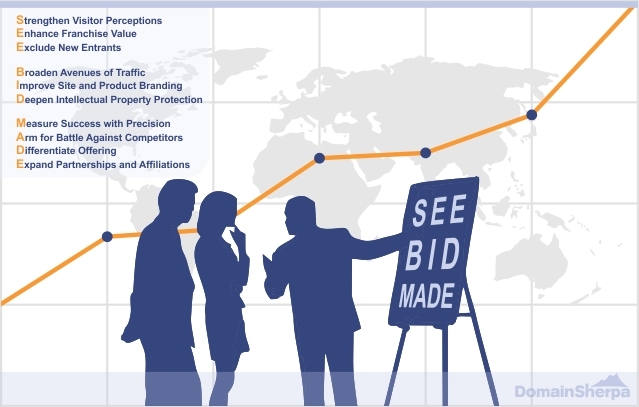 If you want to see more bids made on your domain names, then remember the SEE BID MADE acronym. See I believe the negative perception is based purely on ignorance, greed and sour grapes. 99% of the negative perception won’t be cured by explaining a value proposition to a potential buyer. Just think of the journalists that immediately pen stories with a negative slant. The term squatter is tossed around loosely and it’s not because of some “cowboys” believe me. I think to solve a problem you need to find it’s root. You believe the root is found in the domainers and I disagree. To my second question, in your opening paragraph you say the current state of affairs is ensuring we don’t have partnerships with major corporations, so I was curious as to what good a value proposition was in fixing that issue and who exactly would be a beneficial partner. I’d have to disagree on any value proposition aiding in elevating the value of a domain. Lastly have you spoken with sedo or namemedia about their value propositions? Surely namemedia, who employs a bank of sales people manning phone lines, would have some sort of ammo for their sales force. Sedo also does a lot of talking up on domains. I’m sure they have similar material. Have you looked in to this ? Sorry but there’s just too many words here to read. Great thoughts but failed at having any influence or driving change. Domainers are an ignorant bunch, and that’s the biggest problem. I appreciate the vote of confidence and kind words. Yes, that is the challenge: customizing the raw ingredients to the situation at-hand. And as BullS says, it certainly is easier said than done. But we need to start somewhere. Thanks for the comment. As I mentioned, I’m very much in favor of crowdsourcing the task; and if someone has a shorter version that works, that’s fine with me. To answer your questions: (1) I think that there’s a negative view of the industry…largely because it’s not yet ripened into a real industry (at least as far as the secondary market is concerned, i.e., domainers) – but there is, in fact, a negative perception of it; (2) …not sure how to answer your question, exactly; (3) I don’t think that presenting this value prop. will necessarily increase the value of any particular domain name — but it can’t hurt, because it (hopefully) (a) shows some level of professionalism, and (b) shows end-users that people who deal in website addresses have actually thought-through this stuff. Thanks for the compliment and thoughtful comments. Frankly, I (somewhat) agree with your assessment. But I wouldn’t attribute the need to put together something like this to the cowboys. It’s something that every industry, company, and product manager needs to do — and do well. Mine is only intended to be a starting point. But it’s a bit troubling to me that we’re only at the ‘starting point’ of publishing a value proposition in the year 2011. This should have been done a decade ago. The problem is not with the value proposition, although I agree that this is a very well written one (albeit long). The problem is with the cowboys in the industry that continue to act like yahoos and uneducated country bumpkins who suddenly discovered that they’re property is on top of the largest natural gas reserve in the US — and are causing us to have to write value propositions in order to gain more respect from the main world. When you have a large and lucrative domain portfolio and act like a yahoo, everyone else in the industry gets labeled the same as you. While I find your post a bit too much of a diatribe, it is interesting to see someone make some suggestions to help improve things. Your value propositions seem to be a little to full of marketing fluff for the average Joe (you’ll be lucky if even a C-level guy can figure out what you are talking about). Having stood on the other side and bought names from domainers, all that you wrote means nothing to me. The fact of the matter is most domains don’t have even a remote chance of hitting 50% of my quick short list of qualities that people will easily understand in a 2 sentence or 2 sec pitch. Why do you feel people have a negative perception of domainers ? What partnerships with major corporations would you think domainers would benefit having ? Google or Yahoo maybe ? How exactly would presenting this value proposition boost the value of a domain ? What keeps this domain business goes round and round is that the domain owners have the “fantasy” that their domains are so damn valuable-thinking that someone will make a big offer$$$ the next time they check their email. When a big sale is publicize, oh wow- more suckers will come in and play the domain game.It is like the boom of the real estate-everyone was buying like no tomorrow. Great write-up. Much better than any other value prop I’ve read. What we, as domainers, must do is figure out which of these items applies to EVERY sale — on an individual basis — and make those points to the potential end buyers. It’s that simple. But it starts with a well thought out valueprop, like what this author has provided.